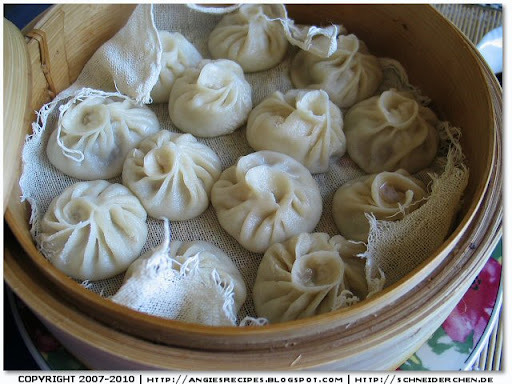 Xiaolongbao, literally "Little Basket Buns",are traditionally filled with broth and pork, but beef, seafood, and vegetables are very often used as fillings. 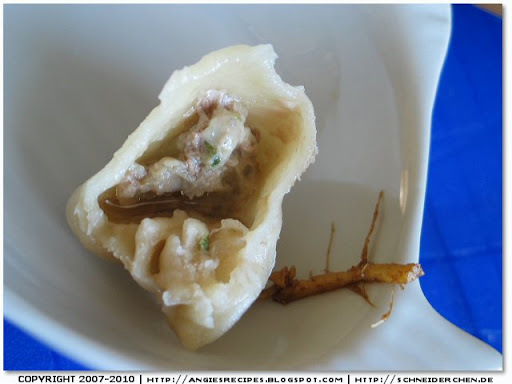 The broth inside is made by using some meat jelly inside the dumpling before steaming. Gelatin melts when steamed. Xiaolongbao always have soup, otherwise they are just Jiaozi. Use a heavy knife to smashed the ginger root. Place them in a bowl. Add in spring onion and water. Squeeze the mixture to release the juice from the ginger and onion. Strain. Season the ground pork with salt, sugar, Maggi sauce and pepper. Mix well. Gradually add in the prepared ginger-onion liquid and mix until all the liquid is absorbed and the mixture forms a firm and cohesive mass. Drizzle in the sesame oil and combine well. Dice the jelly and blend together with meat mixture. Cover with a plastic wrap and store in the fridge while prepare the wrappers. Whisk the flour and salt together in a mixing bowl. Add in water and start mixing by hand. Once the dough has come together, turn onto a floured work surface and knead dough until it becomes a smooth, elastic ball. Cover the dough with a plastic wrap and allow it to rest for at least half an hour. Half the dough lengthwise. On a floured surface roll each dough with palms back and forth to form a long rope of dough of even thickness. Portion the roll into 10-gram pieces and flatten each piece with the bottom of your palm. Use a rolling pin to roll the dough out forming a disk of 7cm with the edges thinner than the center. Hold a wrapper in your left hand and raise fingers up to form a recess. Place 2 teaspoons of filling in the middle of the wrapper. Carefully fold the edges of the wrapper together in a pleated fashion with the right hand. Pinch edges together to close the wrapper. Soak cheese cloth in hot water, wring out water and lay in a steamer. Besides cheesecloth, cabbages, carrot slices, and parchment paper are a good source of lining the steamers too. Put in the dumplings and set the steamer over a pan filled with boiling water. Close the lid and steam for 8 minutes over strong heat. Serve with a sauce dish of thinly shredded ginger and black rice vinegar. Chicken broth contains the broken down material from bones and tendons. When the broth is cooled, it congeals due to the presence of gelatin. Wash the chicken bones and skin thoroughly and add them into a pot of boiling water. Boil for 2 or 3 minutes and then turn off the heat. Drain and rinse the bones thoroughly under the tape water. Fill a pot with water with ginger, spring onions, rice wine, vinegar, chicken bones and skin. Bring to a boil. Simmer over low heat until liquid has reduced by half, about 2 hours. Strain stock into a bowl. Discard solids. Season the stock with salt and pepper. Allow the liquid to cool down and set to a jelly. It’s ready for use. The broth can be kept in a fridge for up to 3 days or frozen for at least 6 months. Coffee cake is either a cake prepared with coffee or served with coffee. Thus a coffee cake does not necessarily contain coffee. Those served-with-coffee cakes are typically flavoured with cinnamon, nuts, and different kinds of fruit and very often have a crunchy streusel topping. Line the bottom of a 26cm springform with parchment paper. Press the sweet crust dough evenly against the bottom and sides (up to 4cm high) of the prepared pan. Generously prick crust with fork. Cover and rest in fridge for 30 minutes. angiesrecipes form. Bake the crust for 12 minutes. Remove and allow to cool. In large saucepan, combine cherries, sugar, water and cornstarch. Cook, stirring about one minute. Transfer filling to cooled crust. Sprinkle streusel evenly over the cherries. Bake on middle rack of oven for 45 minutes or until top is golden. Place pan on a rack and let cool. Crumble, cookie like sweet pastry dough is mainly made of sugar, egg (or just yolk), and flour. Sweet Pastry Crust (Pâte Sucrée in French) is a sweet, crumble, cookie like pastry dough made of sugar, egg (or just yolks), and flour. It’s a kind of shortcrust pastries. Low-fat butter or margarine should be avoided in making pastry because they usually have high water contents. Preheat the oven to 200C/400F. Sieve the flour and baking powder into a mixing bowl. Add sugar, salt, egg and butter or margarine. Mix first at slow speed with a hand mixer, then increase the speed and mix until a soft but not sticky pastry is formed.
. With fork, prick dough to prevent puffing and shrinking during baking. Bake in the middle rack of the preheated oven for 15-20 minutes until golden. The dough can be prepared the day before you plan to use it and should keep in the fridge for up to three days if needed. Pita bread is consumed in Turkey, where it is called “pide bread”, Greece and Romania. The word pita is a Greek term, which means “flat” and spelled “pitta bread” in English. In addition to being flat, pita bread generally has two layers which, after baking separate to form an internal pocket. This pocket occurs because of the extremely high temperatures at which the bread is baked. To make the dough in a bread maker, put all of the ingredients into the bread machine in the order listed, select the “dough cycle” and press “start” . The bread maker stops the process after the first rising. Upon completion of the dough cycle turn the dough onto a floured work surface. Knead the dough until all the air has been removed and divide it into 6 or 12 pieces. Round each into a small ball and then flatten them to make 1.5mm thick disks. Cover the dough with plastic wrap and allow them to rest for about 30 minutes. Now place a baking tray on the middle rack of the oven and preheat the oven to 220C/450F. Arrange pita dough on the baking tray and bake for 6 or 8 minutes until lightly brown. You will need to bake them in two bathes. Remove from oven and place on a tray covered with a clean dishtowel, with another clean towel on top. When thoroughly cooled, pitas can be stored in plastic bags. Pide is a round bread fragrant with sesame or fennel seeds and it's pocketless. The pizza-like lahmacun is made with pide dough that are topped with ground meat and herbs or other different materials. There are regional variations in the shape, baking technique, and the toppings. Whisk together the flour and dry yeast in the mixing bowl of a stand mixer attached with a dough hook. Add in salt, water, honey and olive oil. Mix first at slow speed, when the dough starts to come together, increase the speed to medium and knead until you have a soft, but smooth dough. Cover the dough with a plastic wrap and let sit in a warm place for about 45 minutes, or until doubled. Punch down and round into a ball. Divide in 8 smaller portions, cover with plastic wrap and let rest 10 to 15 minutes. The dough can be divided into 3 or 4 bigger ones as well, like we usually get from the supermarket. Flatten each dough into a 1cm thick round on a baking tray lined with parchment paper. Moisten the bread with water and sprinkle some sesame on the pita. Again leave them, covered on the tray for about 30 minutes. Heat oven to 220C/450F and bake for 12-15 minutes. Chop the spare ribs into inch pieces. Put them into a pot of boiling water and poach for 3-5 minutes. Drain. Blend the pork spare ribs with the marinade and set aside for 30 minutes. Cut the bell pepper and cucumber into serving pieces. Slice the spring onions into strips. Heat a skillet with enough oil until hot. Lightly coat the marinated pork spare ribs with cornstarch. Deep fry pork spare ribs until they are crispy and golden brown. Remove and drain on the kitchen paper. angiesrecipes, return the fried pork spare ribs and the green parts of the spring onion. Season with salt and pepper. Stir well and dish off.